La Quinta, CA: The Greater Coachella Valley Chamber of Commerce, in partnership with the City of La Quinta and the La Quinta Chamber of Commerce are proud to present the 12th Annual La Quinta Hot Rod and Custom Car Show on February 3rd, 2018. This year’s show will be celebrating the 65th anniversary of an American icon, the Corvette. “This event started during my term as Chair of the La Quinta Chamber Board. Car shows bring together communities and offer activities for the entire family. The Mayor’s Choice will be tough this year because I’m a huge fan of Corvette’s!” said Linda Evans, Mayor of La Quinta. Visitors to the car show are encouraged to spend the day exploring La Quinta. They will enjoy the proximity to Old Town La Quinta and many area shops, restaurants, hiking trails and parks. “It’s a great day to spend in La Quinta, come out and enjoy the car show and spend a little time in our downtown,” says Doug Motz, Chairman of the La Quinta Chamber of Commerce. 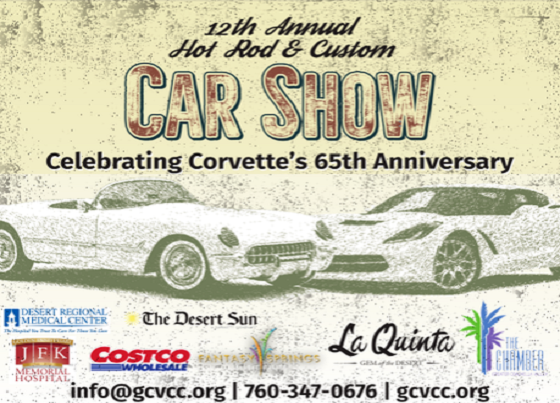 The 12th Annual La Quinta Hot Rod and Custom Car Show is brought to you by the City of La Quinta, Fantasy Springs Resort Casino, JFK Memorial Hospital, and the Desert Sun. For additional information about the show visit lqcarshow.com, or contact the Greater Coachella Valley Chamber of Commerce at 760.347.0676.